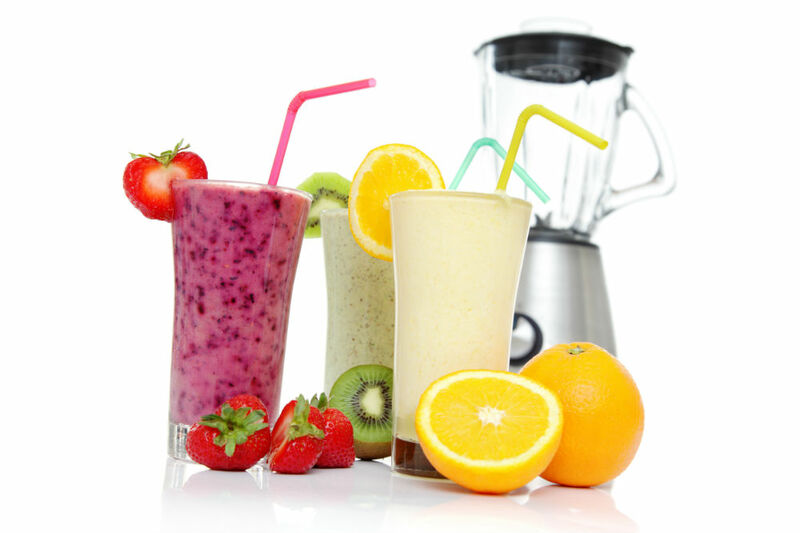 If juices, shakes, and smoothies are your thing and you want to prepare these with ease for you and your family, then you need to find a blender that has all the features that you require to produce the tastiest and smoothest smoothies. There are many blenders to choose from, but be warned not all blenders are created equal. With frozen fruits and ice being a popular ingredient in these drinks, you need a blender that has the power to handle these ingredients without burning out within the first week. This professional high-speed, high-power personal blender from Cosori is a popular choice in the current market. Cosori has upgraded the motor to give it more power; hence, the upgraded version. Even though the motor has been upgraded, the blender is still compact enough to fit neatly on your kitchen counter or to take along when traveling. The Cosori 800w smoothie blender was designed for the busy, on-the-go person who wants the convenience of the blend-and-go without having to worry about pouring into containers and cleaning up. This is more recommended for the single person or a couple who need a quick fix on the way out the door. It may not be as convenient if you want to make large batches of smoothies for a larger family. 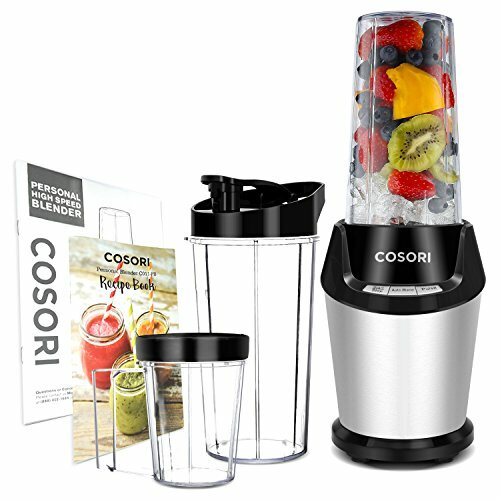 The Cosori smoothie blender will arrive will loads of accessories and all of the following will be found in the box: 1 x Cosori high speed personal blender, 1 x blade attachment, 1 x storage lid, 1 x travel lid, 2 x 32 oz containers, 1 x 24 oz container, 1 x Cosori recipe book, 1 x cleaning brush, 1 x user manual – everything you will need and more. The Cosori boasts a patented 6 stainless SUS blade system which includes a hidden sharp edge, blunt blade and hole blade. The motor has been upgraded to 800 watts and 23,000 rpm giving you enough power to crush ice with ease. The blender has three modes, on/off, pause, and auto, which makes it hands free and user friendly. All the cups that are included with this blender are all BPA free, and all the removable parts are dishwasher safe. It is easy to use with only a three-button operation. It also has a pulse mode. It effortlessly crushes 1/2-inch ice cubes in seconds while the overheat and over-load protection give you peace of mind. It has a suction cup on the base so that it can be placed securely on your counter. The Cosori smoothie blender is UL ETL FCC FDA CE and ROHS approved. It comes backed by a 1-year warranty. Cosori offers you a money-back guarantee if your blender does not meet your expectations within 10 uses. Simple, fast, and efficient blending with the ability to crush ice, seeds and frozen ingredients at the touch of a button, the Cosori smoothie blender will also blend up salsas, spices, even coffee grounds in a matter of seconds. The blender is not silent when running, but has a low noise level. The great thing about these blenders is that there is literally no setting up or assembling required. They arrive ready to plug and blend. It would be wise to read your manual carefully before you switch your blender on, and also perhaps rinse the jars with warm soapy water before the first use. If the Cosori smoothie blender is too compact for you and you are in the market for a powerful blender with a larger capacity jar to allow you to make smoothies for the whole family in one go, then take a look at the Oster Pro 1200 blender. The Oster Pro comes with a single-serving blend and go smoothie cup as well as a 6-cup jar which makes it more versatile. It has a powerful 1200-watt motor, and while it is a great looking blender its very affordable price makes it even more attractive. The Cosori 800-watt smoothie blender comes highly rated and loaded with many great features that make it one of the best blenders available in its price range; it is reasonably priced and affordable. With its brushed steel, black and glass look, it is a smart-looking blender that will be a great addition to any kitchen. It comes with 3 BPA-free containers giving you the freedom of choice. What’s more is that if you are only starting out on your smoothie journey, the Cosori comes with a recipe booklet jam-packed with some of the tastiest smoothie recipes. The Cosori will not disappoint you and is a fantastic choice and strong contender for the title of best smoothie blender. Can You Make Meringue in a Blender? Can You Put Ice in a Nutribullet? What are Blender Bottles Used for? Are Blender Bottles Microwave Safe? Some recommended products may use affiliate links. PrimeShopKitchen.com is a participant in the Amazon Services LLC Associates Program, an affiliate advertising program designed to provide a means for sites to earn advertising fees by advertising and linking to Amazon.com. Amazon and the Amazon logo are trademarks of Amazon.com, Inc or its affiliates. Copyright © 2018 PrimeShopKitchen.com | All Rights Reserved.